Dr. Bhangoo has been practicing Plastic Surgery since 1975 and is certified by the American Board of Plastic Surgery. He received his Undergraduate Degree from the University of Cambridge, England and his Medical Degree from the University of East Africa winning the coveted Muljibhai Madhavani prize which is awarded to the best medical student of the year. Dr. Bhangoo then completed the required training in General Surgery in England. At least three years of training in General Surgery is a mandatory prerequisite for commencing training in Plastic Surgery. He obtained the Fellowship of the Royal College of Surgeons of England, Fellowship of the Royal College of Surgeons of Endinburgh and Fellowship of the Royal College of Physicians and Surgeons of Glasgow. These Fellowships are the equivalent of board certification in general surgery in the United States. He then completed his Residency in Plastic Surgery at Mercy Hospital in Buffalo where he is currently the chief of Plastic Surgery. During his residency, he won many awards including the International Award for Original Research sponsored by the Educational Foundation of the American Society of Plastic and Reconstructive Surgery. His research and publications are on the subject of wound healing and scar tissue and more recently on cosmetic surgery. He is also Clinical Assistant Professor of Plastic Surgery at the State University of New York at Buffalo, and has been very actively involved in the teaching and training of plastic surgeons locally and abroad. He is a member of the American Society for Plastic and Reconstructive Surgery and the American Society for Aesthetic Plastic Surgery. He is a Fellow of the American College of Surgeons, a Fellow of the International College of Surgeons and a Fellow of the International Academy of Medical Sciences. Dr. Bhangoo has presented papers and lectured at many national and international meetings and is a visiting Professor to several universities in India. He is the recipient of the prestigious ETHICON Visiting Professor in Cosmetic Surgery awarded by the Association of Plastic Surgeons of India. Dr. Bhangoo is frequently and regularly invited to India and South East Asia to conduct workshops and instructional courses in Cosmetic Surgery and deliver guest lectures. That is why it is important for you to know about the training and experience of your Aesthetic Plastic Surgeon. Dr. Kulwant S. Bhangoo welcomes you to explore this site for any questions you may have regarding Plastic, Reconstructive and Cosmetic Surgery. Plastic Surgery can also give a psychological boost or simply help someone look as young as they feel. Often, improving a feature of your face or body will enhance your self-image, and that can help you to make positive changes in many areas of your life. Having realistic expectations about aesthetic surgery increases the likelihood that you will be happy with the results. If you recognize a specific area in which your appearance could be improved and you have a strong personal desire to make a change, then you may be an ideal candidate for aesthetic plastic surgery. Dr. Bhangoo is certified by the American Board of Plastic Surgery, recognized by the American Board of Medical Specialties (ABMS), which has approved medical specialty boards since 1934. For specific information on Dr. Bhangoo, continue HERE. Dr. Bhangoo has a clean, state of the art office location where you will receive a consultation. Office hours are Monday and Thursday. The office is located in South Buffalo, click here for Map and Directions. Surgeries are performed at Mercy Hospital and the Center for Ambulatory Surgery in West Seneca. 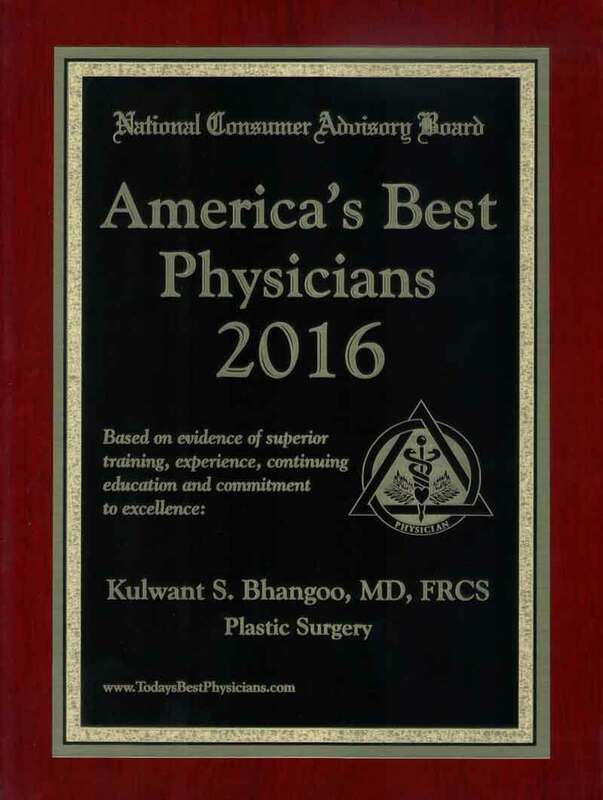 Along with Aesthetic Plastic Surgery, Dr. Kulwant Bhangoo offers all forms of Plastic Surgery Procedures. Aesthetic Surgery patients are provided with a full Skin Care facility to utilize after their surgery is complete. Be Your Best, a book co-authored by Dr. Kulwant Bhangoo, is available for purchase at his local office and skincare locations. The book is a Comprehensive Guide to Aesthetic Plastic Surgery written by the experts. Offering expert advice on all aspects of Cosmetic Plastic Surgery from America's leading Authorities on Cosmetic Surgery. Be Your Best is written for the intelligent consumer who is looking to gain insight and understanding of aesthetic surgery. With Full-Color drawings and details of specific cosmetic procedures, it is a complete synopsis of all the details you can expect when considering various forms of plastic surgery. Dr. Kulwant S. Bhangoo (MBCHB, FACS, FICS, FAIS, FRCS, [ENG, ED, GLASG]) is a World-Renowned Board Certified Surgeon. He has been practicing Plastic Surgery since 1975. He is qualified in all aspects of Plastic, Reconstructive and Cosmetic Surgery. Dr. Bhangoo is an affiliated surgeon of Global Medical Excellence, The Standard for Global Access to Excellent Surgical Care at the Lowest Cost. 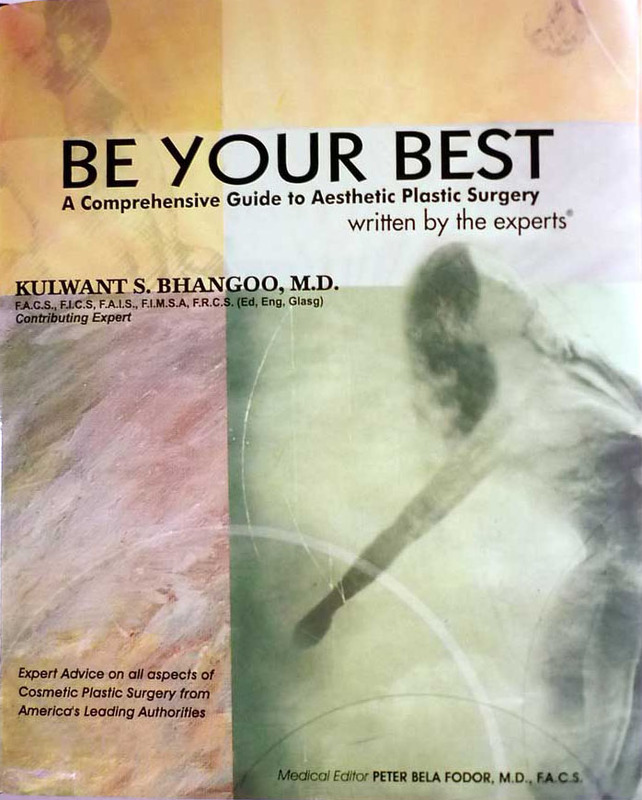 Dr. Bhangoo is a contributing expert to the book, Be Your Best - A Comprehensive Guide to Aesthetic Plastic Surgery. Available at all office and skincare locations. DR. BHATTI IS INTERNATIONALLY RENOWNED AND IS INDIA'S LEADING HAIR TRANSPLANT SURGEON. HE HAS CLIENTS TRAVELLING TO HIM FROM ALL OVER THE WORLD. HE HAS TREATED VERY MANY MOVIE STARS FROM POLLYWOOD, PUNJAB.